I’ve decided to make adjustments to my open position ahead of the ECB decision and presser! As I mentioned last week, some ECB members (unnamed or otherwise) have been coming out of the woodwork to hint that they’re starting to discuss exit strategies for the central bank’s asset purchasing program even as they remain committed to keep interest rates accommodative. On the other side of the trade, doubts on the pace of tightening for the Fed as well as not-so-positive news from Uncle Sam have been turning off traders from buying more Greenback. And that was before the Obamacare repeal brouhaha that’s now throwing a hurdle at Trump’s fiscal policy plans! I risked 0.5% of my account at 1.1475 after the pair broke above its previous week high. But that was last week. 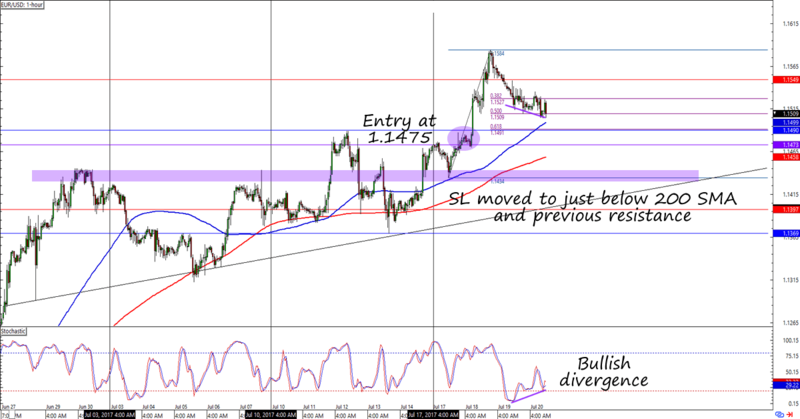 This week EUR/USD has not only revisited the 1.1580 area, but it has also turned back to test the 1.1500 major psychological support. And with the ECB about to print its policy decision, I’ve decided it’s time to move my stop. The ECB is widely expected to keep its policies unchanged but Mario Draghi is also expected to rock the markets by repeating his hawkish sentiments from a couple of weeks back. I’ve moved my SL to 1.1440, which is below the 200 SMA, weekly open price, and the Fibonacci retracement levels on the 1-hour time frame. If Draghi chooses to emphasize the region’s (relatively) steady inflation and positive growth, or if he hints at discussions of possible exit strategies, then we might see EUR/USD make new highs this week. In this case, I’ll be on the lookout for possible levels to add to my bullish position. But if the ECB head honcho tempers expectations by stressing the ECB’s easy monetary policy bias, then we might see a bit of profit-taking from the previous week’s moves before the euro picks up a new direction. Hopefully EUR/USD’s reaction will still give me enough room to make the necessary trade adjustments. Risked 0.5% at 1.1475 with SL now adjusted to 1.1440. Consider another entry if the ECB sounds hawkish. Fingers crossed for a bullish day for the euro!